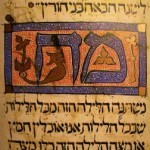 OzTorah » Blog Archive » What is the question? The question seems to be Mah Nishtanah. But there are at least two problems with this phrase. What do we mean by mah? Is it “What?” – i.e. “What is different about this night?” – a question. Or is it “How!” – i.e. “How different this night is!” – an exclamation. On the other hand, if mah is an exclamation, the four statements in Mah Nishtanah are illustrative explanations, and therefore there are no questions at all and nobody is asking anything. What do we mean by nishtanah? WordPress generated this page with 33 queries, in 0.222 seconds.